14-18K yellow and white gold ring set with two round brilliant cut diamonds, total weight of 0.90 carat and six round faceted tourmalines. 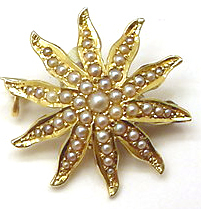 Sunburst brooch with hidden pendant bail made from 14K yellow gold and set with seed pearls. 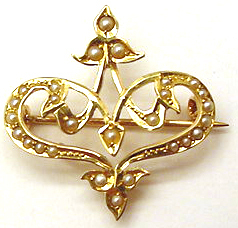 Seed pearl brooch made with 14K yellow gold. 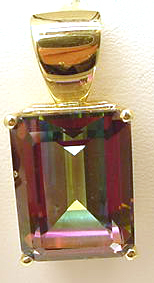 Mystic topaz showing vivid purple and green in 14K yellow gold setting with a wide pendant bail. 18K yellow, green and red gold pendant set with one round cabochon chrysoprase. 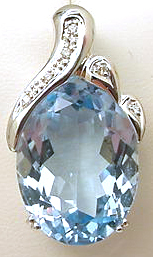 14K white gold pendant set with one oval blue topaz and six full cut round brilliant diamonds set into the design of the bail. 10K yellow gold ring with emeralds set in centre of floral design. 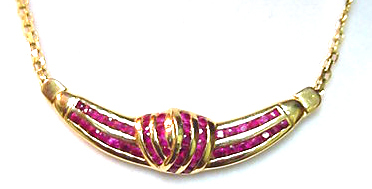 14K yellow gold ruby set necklace. 14K yellow gold sapphire and diamond ballerina style cluster ring. 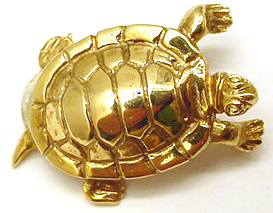 18K yellow gold Cleopatra style necklace.